Michael Brown, the Director of FEMA, has been promoted for his fine work during the aftermath of Hurricane Katrina and he has returned to Washington where he will deal with plumbing and electrical emergencies at the White House. A little known fact: Not a single Arab horse died in New Orleans thanks to the keen focus of Mr. Brown. I was a little saddened to see Colin Powell bad-mouthing the administration for its handling of the New Orleans emergency. He's got nerve. If it weren't for Mr. Powell's speech at the U.N., American might not be in Iraq right now (although we don't really mind since we're still bringing freedom and democracy to the Iraqis). President Bush has made it clear that returning New Orleans to its previous state of sinfulness, debauchery and depravity is his Number One priority. The President then announced, "You know this hurricane business took me away from my vacation a week early, a vacation I'd been counting on since my last vacation in July. Anyway, I've decided to mix some business and pleasure. I want to show the American public and the world that the Big Easy is open for business. So I'm going to finish my vacation in New Orleans. I'm bringing my dad along since Laura doesn't seem interested in joining me." 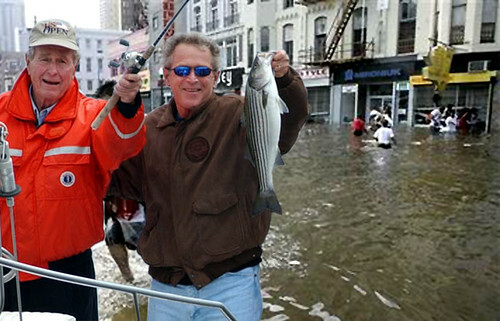 Here are Presidents 41 and 43 enjoying their trip to New Orleans. Notice that Cindy Sheehan is nowhere to be seen. Investigation into "What went right"
Does America really want aid from Sri Lanka?